Remember that trip to Ohio I mentioned earlier in the spring? The one the Girls and I were going to take to calm our inner roller coaster junkies? Well that's where we went last week. The roller coasters weren't the only thrill though, the weather provided it's own adrenaline rush. We left on Friday morning with the intention of stopping in Fort Wayne, Indiana for the night and then continuing on into Oak Harbor, Ohio the next morning. When we left Arkansas had just been upgraded from a "severe" to "extreme" drought region and our county (along with most others) was under a burn ban, so we were excited to see rain. What we weren't excited to see were the effects of the major storms that swept through six states, three of which we were either in, planning to be in, or had just left. This isn't my first experience with driving in unfamiliar territory during terrible weather (remember our exciting nerve wracking drive through the 2008 Super Tuesday tornado outbreak? ), and it wasn't even my last for this particular trip, but I'm going to go on record with I DON"T LIKE IT! The winds that accompanied the storm we drove through in Indianapolis, Indiana affected the satellite signal for Big Momma and we took a wrong turn. That wrong turn provided us with it's own little adrenaline rush when we found ourselves on a scenic tour of an Indianapolis ghetto area. I recommend avoiding that route if possible. The storm knocked out the power to the traffic lights. Want to know how long it takes to get through a traffic light on a four driving lanes/ two turning lanes major highway when that traffic light has been reduced to an "on your honor" four way stop? Exactly 1 hour and 37 minutes, provided three people pull out of your lane, drive across the median, and cut off traffic in the opposite lane (one driver did this while making an obscene gesture to the people in the car he almost ran over, he was obviously a multitasker). It was at this time that the Girls and I noticed we had actually crossed into the eastern time zone and therefore had missed Happy Hour at Sonic (not that we were able to find a Sonic). This only added to the frustration...after all you know how much I hate to lose an hour. We arrived in Fort Wayne, Indiana without anymore excitement. I had considered filling up with gas that evening but since I still had a quarter tank of gas I decided to wait until morning. That plan would have worked if the storm that night hadn't knocked out power to all of the gas pumps. 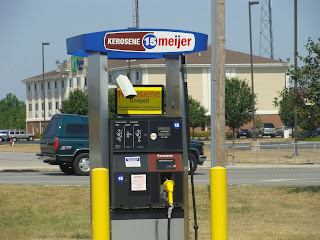 Want to know where they did have gas pumps that actually pumped gas? Ohio! They also have pumps for kerosene. Anyone know exactly what they use that for? Guess what else we found in Ohio!?!? Hail! Yep, that came on Sunday night along with more rain. NG (from the back seat): Did you just hit those lawn chairs with the truck? Me: No, I just gave them a gentle southern love nudge. They're fine. GG: Well it's a good thing no one was around to see your southern loving! Me: The rental rules say 10 pm to 8 am is condo quiet time and it's after 10 now, so hush. However, that was just a temporary fix. The first words out of the Girl's mouths when they called L? "Momma hit some lawn chairs with the truck!" As I've said before... tattle tails! See?!?! They're fine, a little love tap never hurt any chair. We almost made it home without anymore weather excitement....almost. Just outside of Branson, Missouri the skies opened up and it poured, hard. It was that kind of rain that made it almost impossible to see the lines on the road, the kind that has most people pulling to the side of the road with their flashers on. I say most people because after being gone from home for almost eight days and having been on the road for over fourteen hours I wasn't one of them. Nope, I was a woman on a mission... I was also the one driving down the middle of the road. On another note...do you want to know what's in Oak Harbor, Ohio?